Commerce, Justice, and Science—the House of Representatives’ subcommittee that oversees NASA spending—just released details on how they would fund the space agency in 2017. Overall, the news for the space program is very good: NASA’s topline would rise to $19.5 billion—$200 million more than the Senate’s proposal and $500 million more than the President requested. Should this pass into law, NASA would have its best top-line budget (adjusted for inflation) in six years. The bill needs to be voted on by the full House, at which point it would need to be reconciled with a similar bill proposed in the Senate, which was released last month. SpaceNews and SpacePolicyOnline have excellent writeups of the budget, as usual. I will just make a few observations on some key areas, particularly in comparison to the Senate’s proposal. Notes: Astro is the combined Astrophysics and James Webb Space Telescope budget lines. Requested amounts include the “mandatory” and discretionary spending accounts. All numbers are in millions of dollars. The total amount of science funding proposed by the House is significantly better than what was proposed by the Senate, matching the President’s request of $5.6 billion. I don’t have the verbal dexterity to accurately describe how good the Planetary Science Division budget would be if this bill passes as-is, so let’s just say that it’s great. Planetary Science would see a $215 million increase from 2016, keeping NASA on track to launch a Europa mission in 2022, select two new Discovery-class missions, Mars 2020 would gain a helicopter (! ), and every existing planetary science mission would continue. Scientists would see a much-needed 10% increase to for planetary science research. The Earth Science Division is the loser here, which would receive a $231 million cut from 2016. But I wouldn’t panic about this—yet. We need to look at this in context of actions taken by the Senate last month. In their budget, the Senate slashed $270 million from Planetary Science and used that money to increase Earth Science to a record $1.984 billion. I argued last month that this move could be understood as staking out an initial negotiating position before the House released their funding bill. You can read the House’s new budget proposal in the same way—it’s their counteroffer, increasing Planetary Science by roughly the same amount that the Senate cut it, and using Earth Science to support that. Recent history has fortunately shown that both Earth Science and Planetary Science ultimately get increased budgets (as they should) in the final compromise spending bill, and we will strongly encourage this trend to continue. The SLS and Orion programs would continue to receive large funding increases, no surprises there. Commercial crew is not mentioned, which is an implicit endorsement of NASA’s request this year of $1.185 billion. Notes: Requested amounts include the “mandatory” and discretionary spending accounts. All numbers are in millions of dollars. Space operations includes the ISS, commercial crew, and cargo delivery programs. This is the first year that the ARM program had its own budget line as part of the request. The big news is that the House would ban funds from being spent on the Asteroid Redirect Mission, effectively ending the program (though the work on Solar Electric Propulsion could continue). There is strong encouragement from the committee for humans to return to the surface of the moon, “NASA is encouraged to develop plans to return to the Moon to test capabilities that will be needed for Mars, including habitation modules, lunar prospecting, and landing and ascent vehicles.” NASA is already planning to return to the lunar area with Orion and deep space habitats, but the strong encouragement for surface operations is a new salvo in the continuing debate about where the human spaceflight program should focus its efforts. There is a lot more to unpack in this bill, and we will provide further analysis over the next few days. Overall, I’m encouraged by the commitment on both the House and Senate committees to increase NASA’s budget, though obviously there are issues on both sides that need to be worked out. The next step is for full votes in the House and Senate, though, this being an election year, those votes are unlikely to happen. More likely is that this gets picked up again after the election is safely behind Congress, though that, of course, depends on who wins. Mars, a planet with a 600Pa surface pressure, gets a helicopter, while Venus doesn't even get a balloon that can stay aloft to study the planet for more than a couple days.... Come on, NASA, stop this bias.... "The SLS and Orion programs would continue to receive large funding increases" If they would rather, I have a large fireplace that they could throw the money into instead. If the House Appropriations bill were indeed to become law or policy, it would put human space exploration on an indefinite hold ending any chance to advance into the solar system before the 2030s and certainly pushing human Mars exploration to beyond 2050. It would not end human space flight -- politicians are happy to fund human space flight as long as it doesn't go anywhere. The Congressional support for increased SLS and Orion funding and development of Hab Modules is similar to the Nixon Administration of funding for shuttle but refusal of allowing it to go anywhere or have a mission. Maybe all this is ok -- spending on human space flight isn't bad: it just is disappointing when it leads to nowhere. Robotic exploration flourishes and (as I wrote in my book, HUMAN SPACEFLIGHT FROM MARS TO THE STARS) Iit is the future. But being a human - I still hoped for humans to explore Mars. The Asteroid Redirect Mission was to be our first step beyond the Moon -- afraid now that may never happen. There really is no point in arguing with the bizarro world views that NewSpace marketing has generated over the years. Better to just keep it short and simple: 1. LEO and Mars are dead ends. The Moon is the place to go. 2. The SLS is the only hope for Human Space Flight Beyond Earth Orbit (HSF-BEO). Everything else is a complete waste of time and resources and should be abandoned. 3. The rules are simple and clear but as a famous scientist once said concerning the shuttle program, "-reality must take precedence over public relations." The ice on the Moon is the key enabling resource and only nuclear energy can take humans Beyond Earth and Lunar Orbit (BELO). The Moon is the only place to acquire cosmic ray shielding, assemble, test, and launch nuclear missions. 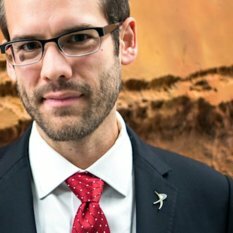 A Mars helicopter for Mars 2020? Ugh; we would be a lot better off if NASA ditched the ridiculous MOXIE and re-instated the SAM II instrument. I wonder how far SpaceX could get on the rocket for their Mars Colonial Transporter with 2,000 billion. Basically SpaceX has the same ambition but a customer base which requires 10-100 times as many launches a year. And yes they will keep launching most satellites on the Falcon 9 and Falcon 9 Heavy, but once launching 10 satellites at 9-10 ton each becomes a real option you can be damn sure the customers will start exploring it. After all a heavier satellite can handle more equipment and as such more customers simultaneously. Not to mention all those countries who might be interested in launching a larger space probe but lack the money to build their own launcher. Would it be legal for Space-X to set up a public donation account for Mars LV's and when enough is accumulated and a mission profile is established, pull just enough funding to build the LV? Good riddance to the ridiculous Asteroid Redirect Mission, but why, oh why increase the SLS and Orion pork? It is not like NASA will be happy with the increased SLS and Orion funding; they will still try to poach from planetary missions. And please, for the love of god, de-scope the idiotic Moxie experiment and re-instate SAM II. Moxie is a publicity stunt by Bolden and the other flyboys in NASA HQ so they can horn in on all the publicity that Mars is getting. But MOXIE is something that can be done in any of a hundred university basements. This ridiculous package would be very amusing if not for the fact that it displaced some real science such as SAM II.